It's a little bit ironic... don't you think? November 11- finally 28 weeks, home from weeks of hospitalized bed rest, finally reunited with my Grace but living temporarily at my parents while the house we had just purchased is remodeled. November 12th- picking out stains for our new hardwood floors when sudden excruciating pains overtake my abdomen. I call the doctor and they say I am probably fine but see me. They think it’s my body adjusting to being upright again. Tiny bones break in my feet having used them for the first time in months. November 13th- I start bleeding and can’t get out of bed but too sheepish to go back to the doctor as they said I was fine yesterday…right? November 14th evening- Blood and tissue is passing and I send a text to my MFM who tells me to rush to the ER. I am admitted and I get hooked up to dreadfully painful magnesium drip to prevent brain bleeds in Emery, meds to slow contractions while we try to get two rounds of steroids in for her lungs. Panic overwhelms the physical space as everyone rushes by with uncertain looks. I’m facing a placental abruption and my waters are leaking. I just remember so much tissue and blood, so much pain, and panic. November 15th- The neonatologist comes in and what may be one of the scariest moments of my life (and Grant’s, my parent’s and Grants’ mom who are gathered in the tiny delivery room.) She unemotionally rattles off all of our odds- for survival, for serious handicaps, and forewarns of the arduous NICU journey. We nod and try not to look at each other and hold it together. Tears well on the inside. Seconds later I can’t help it, I scream and the NICU team assembles in mere second, its truly marvelous Grant and I recall, a fluid team working together. They tell me to hold her in for 2 more minutes, and literally mean to stay pregnant for another 120 seconds. At 90 seconds I tell them I can’t anymore, holding my breath with my heart racing as I battle being unable to keep her in and protected anymore. The next 10 minutes are a blur as Grant and everyone hovers over her teeny limp, purple body- but I couldn’t see her then. Grant and the neonatologists whisk her to the NICU and I’m left alone in a bed of blood realizing that the nightmare I tried so hard to avoid all those weeks on hospitalized bed rest was happening- I was living the nightmare. And oddly - all alone. Grant was with the NICU team with my phone in his pocket, so no one came by to tell me if my 29 weeker was alive. May not sound like terribly long, but those 4 hours not knowing are etched in every ounce of my body with fear and guilt running through my blood of bringing a little girl into the world 11 weeks too early. It would be days before I could hold her, and when I finally saw her, my first thought was she looked like an uncooked purple pork tenderloin. Who thinks that the first time they see their child? With Emery overcoming her 6th battle of pneumonia of 2018 this week, its a reminder how a few extra weeks in the womb would have protected her and let those lungs and immune system grow. With so many beautiful congratulations as we announced the pregnancy of our little boy last week, many inquisitive friends also asked how this pregnancy would go with my history and if I’d be blogging. 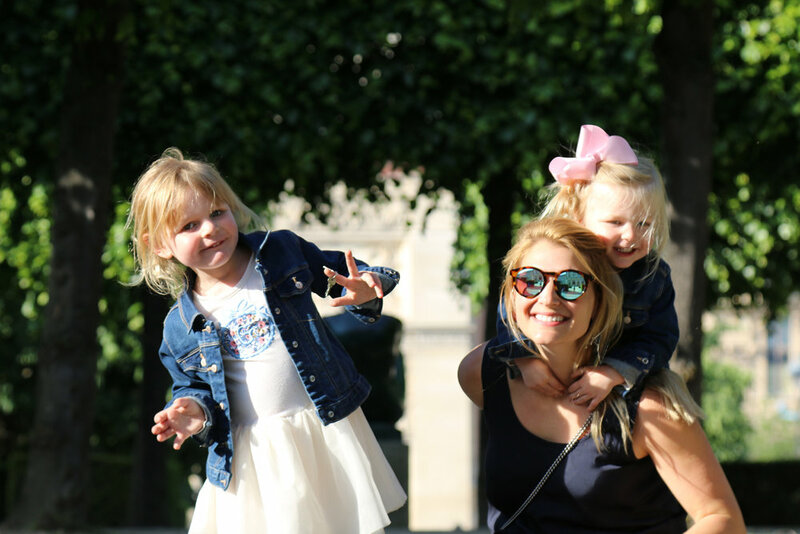 Between working on my doctorate and the two little girls at home, I wasn’t planning on it, but felt compelled to share at least the milestones of this journey. So here is the irony: this week, the week that washes over me like a cloud of inescapable soot, I have to have a fairly invasive surgery to stay pregnant... ironic that it’s the same week 3 years ago my body failed to do so. It could very well be the same day. We go in for pre-op tomorrow, Tuesday, November 13th up in San Francisco with Dr. Michael Katz- a lauded MFM who has some of the highest success rates in the world and will schedule the surgery for sometime the following 72 hours... which encompasses Emerson’s birthday. With this preventative TVCIV cerclage, timing is of the essence as they have to move my bladder and other internal organs to stitch up while keeping the growing baby’s sac small and safe from incision. I remind my self we have a happy ending with Emerson and live life to the fullest each and every day. This week, while we celebrate our sweet miracle baby’s third birthday and try to forget how we lost our battle to stay pregnant longer, we are taking literally the biggest steps we can to stay pregnant this time around with our little boy to complete our family. Wish us luck! Flooded with a bevy of texts, my friends were all excited to share with me the news that the unfavorable diagnosis of "Incompetent Cervix" was featured on recent episodes (2 and 3) of Season 6 of the crowd-favorite Downtown Abbey on PBS. In a weird way, I am filled with gratitude that IC is getting some screen time - through this blog I have met literally thousands of young women plagued by the term - usually only heard in high risk MFM offices - never mainstream. The facebook groups and online forums are filled with women confused as to why they can't carry a child- feeling alienated and marked with a scarlet letter of fertility. While I have yet to see the episodes, according to refinery29 Anna goes to Mary's womens doctor where her cervix is deemed incompetent and then is offered "the stitch" aka cerclage. New baby to snuggle with and guilty pleasure TV?!... you know where to find me the next few days... catching up on all of those shows I missed out on during bedrest (internet was too slow to stream). The past few days have been long. We are so fortunate to have the help of my mom who has gone above and beyond to continue to be the primary caregiver for Grace, allowing me the time to pump (about 7 hours a day right now, every 2 hours around the clock) and be with our little one at the NICU. While it has only been less than 96 hours, it has felt like a month figuring out schedules and quieting the internal battle of being with Grace whom I have missed so much these past few weeks and being in the NICU as decisions about our little girl's care are made. The NICU is scary, but not as scary as I imagined it would be. I am so confident in the phenomenal care our little girl is receiving, and so appreciative of the compassionate and knowledgeable nurses and neonatologists who are providing us with all of the information we need to forge ahead each day, hour by hour. Grant's been so strong, asking all of the questions we need answers to while I can't think straight. The toughest part of each visit is leaving her. We say goodbye, but we don't know if her hearing is developed so doubt she hears us. She can't see us wave or look back. She just lies there peacefully in her pile of wires and tubes, sleeping under the glow of the blue lights warding off jaundice. I have to exit the hospital the same place new mother's leave - and my heart breaks every single time watching the new father's pull up the curb ever so slowly and cautiously before fumbling with the carseat and their new precious cargo. Mom's face aglow with both pride and terror - it is now time for the next chapter of bringing baby home. It's haunting. Why did we get robbed of that? Physically I must have been running on adrenaline those first 36 hours because I felt great (got discharged about 20 hours after delivering) but now everything hurts. I hadn't worn shoes in 6 weeks, and every step I take I feel like little bones in my feet are cracking and my muscles ache all over. I'm weak. From bedrest to child birth to pumping and taking care of a 15 month old, my body has been forced to go from 0-60 and I am just praying it can keep up with the demands. Pathology came back with a report and shockingly the early delivery was not inpart to the Incompetent Cervix which had been the foreboding theme of our pregnancy journey these past few months but instead some sort of bacterial infection that caused the placental abruption leading to bleeding and pre-term delivery. I haven't quite wrapped my head around all of this yet. I can't help but wonder why God thinks I am strong enough for this journey. I don't feel brave enough- my fear is suffocating. I've navigated my own health struggles with MENs/kidney stones/pregnancy throughout the years, and last year with 6 week old Grace in the hospital with her kidneys, but neither of those could have possibly prepared me for the complete helplessness that overwhelmes each minute of every hour. I tried so hard to keep her cooking, but I feel like I failed her only making it to 29 weeks... 79 days early. This poem was sent to me and I have to read it a few times each day for reassurance that somehow I will be able to dig deep inside of me and physically, mentally, and emotionally be able to continue this journey per God's assignment. Somehow, I visualize God hovering over Earth, selecting his instruments for propagation with great care and deliberation. As he observes, he instructs his angels to take notes in a giant ledger. ”Armstrong, Beth, son. Patron Saint, Matthew. ”But does she have the patience?” asks the angel. ”And what about her Patron Saint?” asks the angel, his pen poised in the air. God bless you all, thank you for your continued prayers- they are our sustenance. Today is world preemie day, raising awareness about the battle NICU nurses, doctors and parents of preemies fight for the littlest ones born too soon. I have so much to say, but words will fail to express my heart right now as I am still grappling with the turn of events- grateful our beautiful girl is here and thriving, but terrified. The vulnerability I feel is unlike anything I have ever experienced, with emotions ranging from joy to guilt and so many looming questions. I know they say not to ask those questions: the "what ifs" but I can't seem to quiet my head. What if she had been born at 24 weeks? Thank goodness I did the 5 weeks of bed rest. But what if we had gone for a cerclage instead of a pessary? What if I hadn't been released from the hospital? What if I wasn't allergic to the indomethacin and could have used it to halt labor just another day or two? An allergic reaction for me that would have allowed my baby to cook surely would have been better, right? It seems to be a dark tunnel of confusion, but we are doing our best to stay positive in that we had a good delivery, we were in the right place to get her phenomenal care from the start, and we need to be grateful that maybe bedrest did buy her another 5 weeks of cooking. They tell us we can bring her home likely end of January. Grace won't meet her until then. The holidays are going to be extremely tough (but fortunately Grandbarb already ordered her personalized stocking to hang on our fireplace with the rest of the family). Already it is exhausting pumping every 2.5 hours and getting the milk to the NICU, and balancing recovery (I was discharged from the hospital 20 hours after giving birth- I can't believe it hasn't even been 48 hours since this began to unfold) taking care of Grace (fortunately we are still staying at my parents and have their help while our house is being finished), and being at the hospital so we can understand what they are doing to our sweet one. Yesterday super-dad Grant and I had a chance to hold her for the first time -- and with the cpap machine removed we could finally see just how tiny her features were. Having only seen her through the Isolette, she seemed small but perfect- just a miniature baby. But holding her crushed both of us, she is so tiny and frail and hooked up to many lines and wires. 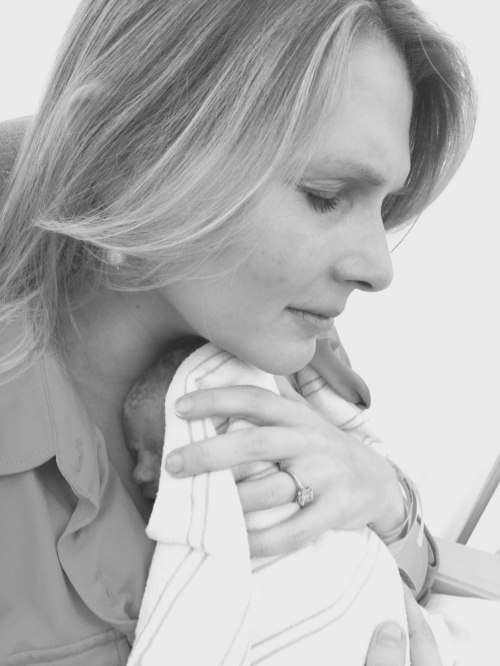 I couldn't help but feel frustrated that I was robbed of the birth experience of holding my baby right when she was born, and leaving her at night to go home is the toughest thing Grant and I have ever done, but we know she is in good hands. 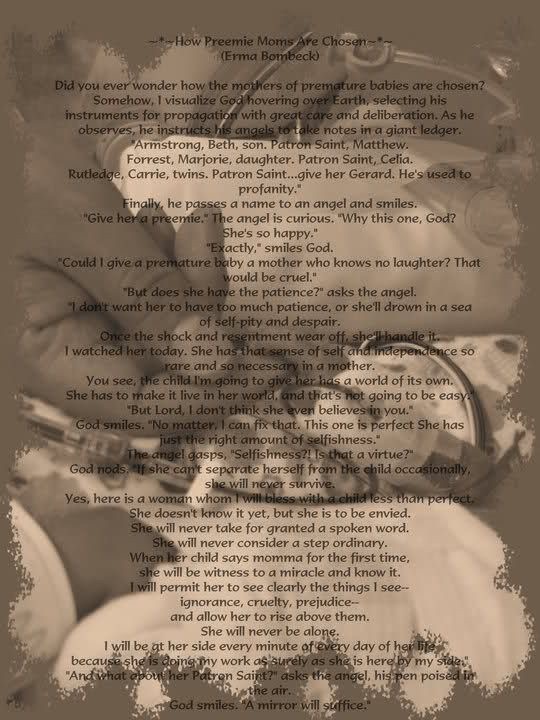 This piece was sent to me by a friend, and if there are any other preemie parents out there reading, I thought you'd appreciate. I did. Dr R (one of my favorites) was on call and eventually came around to do an exam where he concluded I had a partial placental abruption - a somewhat common occurrence (discovered in 1:150 pregnancies, sometimes goes undetected) where the placenta separates from the uterine wall early- causing premature birth or still birth. With very real risks of potentially having to deliver if things progress, I was being admitted again for at least 4-5 days for observations. Frustrated, I was happy to at least have a game plan. Grant and I continued to play while I got another round of betamethasone steroid shots for the baby's lungs, drew more blood and did a whole ton of weird tests since I had been in the hospital in the past month. Then quickly, I started getting pretty painful contractions out of nowhere, about every four minutes. The nurse came in concerned and noted that maybe my uterus was irritated and reacting to the exam, probably the contractions would go away. Dr R rushed in a few minutes later saying he wanted to start me on anti-contraction meds- only problem is I am deathly allergic to aspirin so indocin was not an option. IV running fast bags of fluids, I started on 10grams of procardia, prescribed to get another dose in 4 hours. I sent Grant home as it was midnight and I knew I was in good hands. Unfortunately my contractions failed to slow, instead picked up rapidly and were growing in intensity, now 3 minutes apart. I was given another dose of procardia and that also didn't do the trick. Twenty minutes later another dose, followed by visits from Dr R explaining that my contractions were now 2 minutes apart and the on-call OB/gyn would come to discuss options if we couldn't stop labor. We were terrified. Only 29 weeks (tomorrow). The contractions were not coming under control. I was also starving (hand't eaten since lunch) and hangry. Had we not gone into the hospital, we wouldn't have had the cervical check that was causing these contractions and possible labor. Another round of procardia settled down the contractions to be manageable fortunately, so 14 hours later we are still sitting here in triage figuring out if I go to Labor and Delivery or the Antepartum/Moms Unit. Looking like Moms Unit for observation!! I am processing the nightmare of last night (words don't do it justice in describing the roller coaster of emotions). On one hand the Incompetent Cervix and Partial Placental abruption have nothing to do with each other from the POV of clinical studies. My body just stinks at being pregnant. On the other, maybe they do- at the very least it means I am really high risk and the best place for me is here. I am wondering if the dilation would have progressed without the exam, what would have happened if we just monitored closely at home. I am honestly in a bit of ill spirits, frustrated and trying not to be defeated. Glad we didn't deliver right now, but surviving off a mixture of anxiety and adrenaline. Hope you and yours enjoy a nice weekend! Forewarning: this post may get a bit graphic. I am still processing everything, and would probably have avoided posting, but I want this to chronicle the reality of how scary being pregnant with an incompetent cervix can be for those of you facing the same battle. I try to avoid unnecessary medication at all costs, but I took a single Tylenol pill Wednesday morning to hopefully take the edge off of things. An hour later, I went to the restroom (chugging bottles of water for the kidney stone means frequent trips!) and discovered I was bleeding. I've never bled before in pregnancy. I screamed for my mom, Grant came. I went right back into bed, left a message with my MFM's receptionist, and tried my best to not read the internet front-to-back (there is a ton of bad/scary information out there about bleeding at 28 weeks). Two hours passed and I still hadn't heard from my MFM and the bleeding and pain (about a 4, but my 4 is probably a normal gals 6 or so after delivering a 9.5lb baby and multiple kidney stones) continued, I called Grant to pick me up and take me to the hospital but my doctor called in response to my email (annoyed her receptionist hadn't passed along the earlier message) and had me go in to see her colleague instead. We did a AUS, TVUS and speculum exam which showed my cervix is dilated through and through about 1.5 cms but that the pessary was in place and I am still only 30% effaced with baby head down. As I wasn't having regular contractions and my water was still intact, Dr. S kind of wrote it off as just being inconclusive, likely just pregnancy progressing. Maybe I have kidney stones (but then why the bleeding and tissue/big blood clots) Maybe I am in early labor and this was the grossly described "bloody show" (but why has it now lasted 3 days?) The ultrasounds revealed that it likely is not an issue with the placenta or umbilical cord (two reasons pregnant women in their third trimester sometimes have bright red clotted blood- emergency situations where we would want to induce). At this time, we don't really know what is wrong, why I am bleeding and why I am in so much pain... so we are not doing anything...and that gives me the greatest anxiety. I need numbers and percentages and data and plans of action! Fortunately baby checked out okay so it doesn't seem to be affecting her. The pain was so bad Wednesday night, there was a time I definitely thought I was going into labor. Fortunately we are still hanging on today on day 31- just with a lot of question marks. Sunday will mark 29 weeks pregnant and with each day we are gliding into a zone of greater comfort and safety should we deliver. I am an emotional wreck, I haven't wanted to see or really talk to any of my friends because I just don't want to really process all of the uncertainty looming right now. 80% of the day I feel okay, just dull lower back pain, but the other 20% has been pretty bad, with hour long episodes of contractions/pain/bleeding.